Neel Trivedi talks about Kishore and Ghazals…. Kishore Kumar is one of the most versatile singers ever in the Indian film history. However, no matter how popular one gets, celebrities always have their fair share of critics and in that light Kishore Kumar was no different. Sure he was great in funny songs, they say, but he never sang ghazals, qawwalis, bhajans and/or classical songs. Of course they are wrong. Any true Kishore Kumar fan could easily create many valid arguments against the claim and it is my wish to do just that in a series of articles focusing on Kishore Kumar’s songs that may not have gotten too much attention during their time, but today could dispel any myth the critics have that KK wasn’t versatile. In this particular article, I will focus on some of Kishore Kumar’s best ghazals. Keep in mind that these are certainly not all of KK’s ghazals, just ones that seem to stand out and some of my personal favorites. A funny thing happened in 1969. KK was till then struggling to get playback offers except in the films that he acted in. But in 1969, he got an offer. Prior to that, KK’s playback experience was limited to Dev Anand and comedians like Bhagwan, Agha, Mehmood, etc. But in 1969, S.D. Burman gave him a life changing opportunity to sing in Aradhana (yes, my research tells me it was S.D. Burman’s choice to have Kishore Kumar, not R.D. Burman like many stories point out). And what an opportunity it was! KK sang three songs, two of which were super hits back in the day, (Mere Sapno Ki Rani & Roop Tera Mastana). And so a run at the top started which lasted until his unfortunate death in 1987. All of a sudden, music directors who kept a closed ear on KK began to experiment with him and how! One of them was the team of Laxmikant Pyarelal. Till then, LP were staunch Rafi loyalists and only utilised KK in films in which he acted. But in 1971, they did the unthinkable. They gave the regular “filmy” songs to Rafi in Mehboob Ki Mehndi (and that too for Rajesh Khanna who by now had declared KK as his singing voice) and made KK sing the ghazal! What prompted them to do such a thing, only they know. But the effect was simply marvelous! The song proved that KK could sing a ghazal just as good as anybody else. Particularly, KK’s musical talent comes out each time he sings the words “dawa nahin,” and the subsequent Kaafiyaas of the ghazal after that. Simply superb! Again, some strange circumstances here. O.P. Nayyar was another music director who always preferred Rafi and sometimes Mahendra Kapoor. For whatever reason however, KK got to sing some of his best songs in this movie, one of them being the beautifully composed, written and of course sung, Savere Ka Suraj. Though my knowledge of classical music is limited, I think this song is based on the raag Yaman Kalyan (corrections are welcome if I’m wrong). In this particular song, I’ve noticed that KK, who was very articulate with lyrics in his songs anyway, seems to be more articulate then usual, stressing each word like only he can. Perhaps it was because this is a ghazal, where emphasis is always put on the lyrics. Whatever the reason may be, the effect is awesome! The only negative thing about the song is the picturizations which didn’t quite live up to the quality of the song. Thank god that KK’s voice is so good and powerful that it overshadows anything else! Not too much to say about this one because everybody has heard it. Until then, Yash Chopra had always directed movies under his brother, the late B.R. Chopra’s banner. In most cases, the music in those movies was scored by Ravi and the singers were mainly Mahendra Kapoor, Asha Bhosle and sometimes Rafi. When Yash Chopra broke away and formed Yash Raj Films, he decided to form his own musical team with Lata Mangeshkar and KK. From then on, he took KK in most of his movies until he died in 1987. Daag of course, also starred Rajesh Khanna so KK was the obvious choice here. Some thoughts on the song: KK sang this wonderfully (as always) and had some nice modulations on this song. They lyrics are also well written. One thing that always bothered me however, is the actual composition by Laxmikant Pyarelal. It was good, but considering that this is a ghazal, I always felt like they could have added something more to it. Instead what you get is a ghazal that sounds totally “filmy.” Hence, a lot of people don’t bother to put this in the category when talking about ghazals in films. And considering how good KK sounded in Mere Diwanepan Ki, you would think they would take advantage of his abilities and give him something more to work with. All in all however, a good song. A very rare song indeed from a forgotten movie. It’s unfortunate because this movie had some really good gems scored by Vanraj Bhatia (a very under-rated composer in my opinion). If you haven’t heard this one, you owe yourself a real treat. One thing in this particular song to watch out for is how after the mukhda, the antaras take somewhat of a different turn. KK of course handles it in an excellent manner. I think there is a female version of this song as well, but I haven’t heard it. All in all, one of KK’s best songs in my opinion! What do you guys think? Poor Jeetendra! This movie was supposed to be his personal mega-project and took many years to make. Alas, the film, directed by H.S. Rawail who was known for making Muslim socials, sunk without a trace at the box office. If there was one consolation, it was the music by Laxmikant Pyarelal. Being a two-hero movie starring Rishi Kapoor and Jeetendra, LP divided the songs between KK and their favorite singer, Rafi and came out with some melodious songs. One of them was Sarakti Jaye Hai Rukh Se Naqab. Ardent ghazal lovers may recognize this ghazal as sung by Jagjit Singh. KK goes for a fairly deep and strong voice in this song and, with this being a ghazal, stresses out each word as only he can. Only one minor hitch I can think of and that is no fault of KK. It’s been said before that whenever KK felt uncomfortable with a particular word(s) in a song or if he didn’t understand it, he would ask for it to be changed so he could convey the lyrics with the right emotion. Of course in a traditional ghazal, you can’t do that. There were a couple words which I felt KK approached quite hesitantly, particularly in the line Haya Yak Lakt Aaye Aur Shabab. Then again, mabye I’m nitpicking here and maybe KK was just going for some modulation. Either way, KK still sounds perfect in this song along with Lata Mangeshkar, proving that he could sing a ghazal, even a traditional one, as good as anyone. During the 1980s, a lot of mediocre songs were being churned out by various music directors, particularly in those gaudy South Indian remakes starring Jeetendra. Outrageous clothing, outrageous dancing, outrageous music and lyrics filled those movies leaving KK to sing so many songs that failed to do justice to his voice. Keeping all that in mind, Sharaabi was like a breath of fresh air. The music by Bappi Lahri, was surprisingly melodious and very Indian, at that. The song itself is a masterpiece and it’s a crying shame that it hasn’t received more attention. The music is almost perfect and so are the lyrics. Notice the way KK makes a weeping sound as he begins each verse and how he almost breaks down in the last two lines of the song. Whether this was planned or not, there is no way of knowing. It sounds very real like KK is really about to cry, but then again, that was KK’s specialty. He was the king of emotions. A couple of significant things to point out: This was one of the last movies in which KK sang for Amitabh before they had their tiff. It would be years before KK sang for Amitabh again, (they patched up during Toofan and Ganga Jamnua Saraswati) Not so coincidently, Amitabh’s career also started nosedive after this movie. Another thing to point out is Prakash Mehra’s writing talent. Mehra actually started out as a lyricist in a couple of films (I distinctly remember reading his name in a couple of B&W movies) before becoming a director. I guess the lyricist in him never died because he continued writing at least one and sometimes more songs in each of his movies. I genuinely feel that this may have been his best outing as a lyricist. In some ways, the lyrics are reminicsent of Chingari Koi Bhadke from Amar Prem and I mean that in a good way. All in all, a near-perfect song! Surprise surprise! The music is of this beautiful ghazal is by none other than Anu Malik, now well-known for being a more westernized composer. Who would have thunk it? 🙂 Anu Malik (or at the time Annu Malik), had just started his career a few years back (Hunterwali in 1978) and had one significant film, Poonam (1980), to his name. In a perfect world, this ghazal, written by Hasrat Jaipuri, should have made him a hot prospect in Bollywood. And if it had, who knows, maybe he would have stuck to being an Indianised composer. But it was not meant to be. Whether it was because this movie came out during the disco-era in Bollywood and people wouldn’t accept such songs as quickly or because the movie itself proved to be a dud, who knows? Either way, the music of this movie did not get its due and neither did KK’s ghazal. One thing to watch out for is KK’s modulation in the song. He goes from whispering to being boisterous to whispering and back to boisterous at various places in the song as per the requirement of the song. Amazing! If this song had come out in the 60s or early 70s it may have had a more significant shelf life. A significant song for so many reasons, one doesn’t even know how to begin to list them. This was of course, KK’s first full-fledged song and first solo in movies ever. Before that, his repertoire consisted of having one or two lines in a few songs in the 1940s and two solos recorded for a private album. It’s no secret that KK idolized the legendary K.L. Saigal and it’s nowhere more evident than in this song. The amazing aspect however, is that KK’s voice, however much Saigal-esque it is, still suits Dev Anand. KK’s voice was still very young but then so was Dev Anand. Seeing this song, it’s no surprise that Dev Anand and KK formed a life-time relationship only to end after KK’s death. It’s also important to note that considering this was KK’s first full song, and he had no formal training, he did a darn good job! In the more recent years, ardent ghazal lovers probably recognize this ghazal as sung by Habib Wali Mohammad albeit, to a completely different tune. I guess this one comes with an asterik as the movie was never released. However, any true KK fan has heard at least one verse of this beautiful ghazal, composed by KK himself as the movie was his home production. How this song came to be makes it even more interesting. 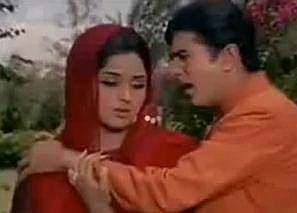 Amit Kumar recalled the moment in an interview: The unit of Pyar Ajnabee Hai was recording the title song (also a wonderful song by KK and in a female version, Lata Mangeshkar) when the recording was finished. All of a sudden, KK told Yogesh, the lyricist and his musicians to stick around as he had an impromptu idea for a song. He told Yogesh of the tune he had just thought of and told him he wanted a song with words like junoon, diwangi, luft. He got someone on the keyboard and guitar and told them what was going on his mind. As KK hummed out the tune, Yogesh started writing the lyrics right then and there! When someone pointed out that there was no situation for a song like that in the movie, KK’s response was, to hell with the situation! I just want to record this song! And so a real gem was born! It’s a shame that the full song was never released. If it was, I think KK’s legacy as a singer would have been even greater than it is today! What to say about this wonderful song? This is another song that is remembered by KK’s most loyal fans but seems to have been forgotten by the general public. A beautiful ghazal composed in raag Hameer (corrections are welcome if I’m wrong) by the late great R.D. Burman, KK’s sheer voice ability in this song is something to watch out for. For one thing, he seems to have modulated his voice to sound just like Sunil Dutt (something KK was well known for doing). Listen to the way KK sings “jaag uthi hai.” It sounds just like Sunil Dutt is singing! Another thing is something that KK rarely did in other songs is taking harkats. But in this song, my my my! It proves that KK, despite his lack of classical training, could hold his own against anyone, at least when it comes to playback singers. Even Anand Bakshi, who was known for writing lyrics for the “common man,” seems to have stepped up his game and written some mind blowing lyrics. A semi-classical song which is also a ghazal with good lyrics in which KK takes harkats; what more do the critics want??? So there you have it. Some of KK’s best ghazals which prove that he was capable of singing them. Of course, like I mentioned in the beginning of the article, these are certainly not all of KK’s ghazals. Feedback, be it negative or positve, is always appreciated! This entry was posted on Thursday, September 23rd, 2010 at 10:17 am	and is filed under Trivia. You can follow any responses to this entry through the RSS 2.0 feed. You can skip to the end and leave a response. Pinging is currently not allowed. Thanks for a very informative article on Kishoreda’s ghazal. I visited this site after long time and found many of my old mates missing here. Me, Paramjeet, Satyansh, Vitthal, Kishorefan, Raj etc had a wonderful discussion phase once here which unfortunately does not exist now. Anyways, coming to the topic, Ghazals are basically Urdu poetry distributed in ‘Couplets'(two lliners) , with the antaras which either are separate/independant or converging into the same rhyme of the mukhda. The examples which you have given out of them, Manzilein apni jagah hai and Mere deewanepan ki are not true Ghazals. I will cite some ‘TRUE GHAZALS’ of Guru to expedite the same. Mere naseeb dekhiye paas woh hokar door hai. Kehne ko bagh mein bahar, aayi hui zaroor hai. Dil mein kisika gham liya bas yeh mera qasoor hai. Mujhe ik baar phir apni mohabbat yaar aati hai. Mera soya hua dil dekhkar woh bhi badalta hai. Mere seene mein phir wohi dabi armaan ubharte hai. As given in Song-2 – Chand- Ghazals have that tendency where the poet mentions his name in one of the couplets without losing context. Chand here is the name of the hero of that film(played by Kishore only) who writes and sings ghazals and qawallis. 2. Husn bhi hai udaas. 4. Woh dekhe to unki inayat. 6. Mere dil mein aaj kya hai. 4. Jaane kya sochkar nahi guzra. 5. Yun neend se woh jaan-e-chaman. 6. Dil aaj shayar hai. 7. Kabhi beqasi ne mara. Nazmas have almost a similar ‘singing skill set’ however to Ghazal like pauses, prnounciation and tempo. Dekha hai zindagi ko written by the Great Sahir Ludhianvi, composed by Ravi and sung by Kishore again follows the Ghazal pattern. In the nazm pattern, from the same team, there lies another gem- Dil mein kisike pyar ka jalta hua diya. Needless to say, analyze both the forms,and you see Guru excelling everywhere as well. Thanks for your feedback. I was fully aware of the rules of Ghazals when I wrote the article. However, in the modern sense, there are many ghazals, even by the likes of Pankaj Udhas & Jagjit Singh which break the traditional rules of ghazals, yet still fall under the category of ghazals. For example, there are ghazals which don’t have any Radif in them which are called Gair-Muradaf ghazals. There are even ghazals which don’t follow the rule of having the same beher (meter) anymore but are still present in ghazal albums. In fact, Manzilen Apni Jagah Hai is even mentioned in an an essay from a book called Aaina-E-Ghazal by Arshad Jamaal. Just thought I would add to the discussion: Here’s why Manzilen Apni Jagah would fall under the category of ghazals: It has the same beher in all the shers as evident below. It has a Radif, (kya kare) and a Kaafiya (musafir, bhala phir, doobta phir, hausla phir). Granted, the beher is kind of long so it may not fit in one line when pasting in this comment box but you can still check out the length. And finally, it’s sung like a typical bollywood song (like Hum Hai Rahi Pyar Ke) so the meter is kind of hard to catch in the verses. Yes, no doubt you are right in your observations on modern ghazals. My mentioning was only to highlight that Guru had excelled in traditional ghazals as well. So, if this is the case, why to not mention those traditional ghazals as well which he sang under Anil Biswas, S D Burman, Khayyam or O P Nayyar. Otherwise, every point you mention is well taken and granted. WHERE HAVE YOU VANISHED ? I TOO VANISHED BECAUSE YOU HAVE LEFT. INDEED I FELT REALLY HAPPY ON SEEING YOUR POST AND REMEMBERING OUR BEAUTIFUL DISCUSSION. IT IS A LOT OF PLEASURE TO READ YOUR POST HERE ONCE AGAIN AFTER A LONG LONG TIME. DEAR ARGHYA JI, IF YOU PERMIT WE CAN ONCE AGAIN BRING BACK THE GOLDEN MOMENTS, HOPE OUR FRIENDS TOO WILL JOIN – IN A HEALTHY WAY. I NEVER KNEW KISHORE SANG SO MANY GHAZALS – THAT IS INDEED VERY VERY GREAT, I ADMIRE HIS VERSATALITY – ONE OF THE GREATEST TALENTS THE COUNTRY HAS PRODUCED IN BOLLYWOOD ALONG WITH MOHD RAFI JI. I SHALL WAIT FOR YOUR RESPONSE MY DEAR ESTEEMED FRIEND. MY AFFECTIONATE AND WARM REGARDS TO ALL OF YOU. Brillaint atricle indeed excellent topic adn u must be complimented for that i was not aware of the Gazal of Dard ka Rishta that u have mentioned as i had an impression that it had been sung by Mehandi hassan sahib but now i will download that song and listen to that in great kishore da voice.i have huge collection of kishore da pictures and songs .I request kishore da fasn to please post some rare pictures of kishore kumar on this website. wonderful ! i loved it sir. i have created an illustrated article of a slightly different taste that spreads over 36 pages [A-4size] in case you care to read (not published as yet, looking 4 avenues). i am from KOKRAJHAR/ASSAM, as my portfolio i have a T.V.interview taken by KHONJ-KHABOR/AKASH BANGLA T.V. telecasted on 14th November 2006. unreleased ‘yeh bheegi bheegi raat na hoti (HUMDARD) – a heart touching solo too was an added attraction of the half-n-hour show. Without Kishore, world of music is like a body without soul! Kishore Kumar is simply incomparable. am sudheer from hyderabad and am a sports journalist. i cant explain how big am a fan of Kishoreda. even jab tak maine samja jeevan kya nfom bheegi palkhe is a sort of ghazal. do you have the bhajan song from unlreleased film suhana geet baje baje baje baje basuriyan. I read out ‘Marks’ sayings. ya that part is i suppose “sa sa sa sa ga ga ga sare ni sa sa sa,pani sa pani sa maa pani….” I think there was no reason behind that if some pandit sang that part,coz ‘Kishore Kumar’ was moody & a little bit of ecsentric character.I heard sometimes he refused to sing many songs,many part of the song unnecessarily time to time just for his mood.I suppose something mi8’ve happened like that.There is a song of him.”Nothing is Impossible”.Really in music nothing was impossible for him. In this case,thoz who haven’t listen, I wud suggest them to listen a particular obsolete fun song of him.”jadu dar gayo re” or known by “banke bihari”. Film- “Humare tumare” JUST LISTEN!! I read out ‘Marks’ sayings. ya that part is i suppose “sa sa sa sa ga ga ga sare ni sa sa sa,pani sa pani sa maa pani….” I think there was some reason behind that if some pandit sang that part,coz ‘Kishore Kumar’ was moody & a little bit of ecsentric character.I heard sometimes he refused to sing many songs,many part of the song unnecessarily time to time just for his mood.I suppose something mi8’ve happened like that.There is a song of him.”Nothing is Impossible”.Really in music nothing was impossible for him. In this case,thoz who haven’t listen, I wud suggest them to listen a particular obsolete fun song of him.”jadu dar gayo re” or known by “banke bihari”. Film- “Humare tumare” JUST LISTEN!! Kishore kumar was a good singer. He was another talent like the SPB of the south. These singers had such talent that without training they could grasp things well and sing the song to the satisfaction of music directors as well as many people. Kishore kumar’s turning point in 1969 with aradhana was a remarkable feature in bollywood industry. The industry got another singer to entertain masses, along with mohd rafi ji. It is indeed a good article here to note regarding the ghazals rendered by kishore in a nice manner, generally the genre being regarded as special in the voice of mohd rafi. Kishores natural bass voice had that strength to bring a beauty to the composition for which he was preferred. In fact, if it is true, SD Burman wanted kishore to be preferred for aradhana, I think it was RD Burman or pancham da who was, to a large extent, responsible for kishore kumar’s rise. The culture of music which underwent a change in the 1970’s onwards, kishore could well adapt to the same and was successful in becoming a popular singer in the hindi film industry, which status continued until his death in 1987. Even in 1960’s the songs such as yeh dil na hota bechara etc. were quite popular hits and kishore’s natural flow of voice created that attractive effect in his songs. His duets like yaadon ki baraat & salamat rahe dostana hamara etc. with mohd rafi ji, ek chatur naar from padosan & yeh dosti etc. with manna de etc. too had become quite popular in those days and were very attractive numbers. Bollywood is fortunate to have such singer with the natural talent. A rare article on ghazal rendering of kishore kumar. thanks for your comment. but are u sure really kishore did not sing that part ? because as for speaking that change of voice in that sargam part we generally feel it was not kishore, but if you hear mere naina sawan bhadon there also in some part his voice changes. actually he could change his voice effortlessly. just hear a song from film GURU of mithun chakraborty, there is a song “kaun kahta hai ki daru kharab” just hear the beginning of that song and u will understand what i mean. actually i do think that nobody could ever understand kishore properly, he was and will remain a mystery forever. we can understand the greatness of rafi, manna, hemanta but this man is a real wonderful mystery. don’t u agree ? we can only feel his voice power but cannot understand it. Thanks for providing us an insight into the ‘Ghazals ‘ sung by Kishore Kumar.You started this article on the note of sharing the ‘Genres’ which are famous for not being able to be sung by Kishore but you end up only focusing on the ‘Ghazals’ ,maybe you will post some other articles to prove your point.Or maybe you will not be able to because you will not find any quawwalis ( please do not tell me that ‘wada tera wada’ is a quawwali- its only having the theka and the picturisation of a quawwwali),any religious songs,any bhajans and classical songs. You mention that Kishore was the most versatile of singers in the hindi film industry!!!! -and he could not sing all the above mentioned genres of songs-more better all music directors of the golden period of hindi film music did not find him worthy of even thinking about him for singing all these type of songs as well as the type of songs that you consider were his “Domain”-the funny songs.They chose him to sing these funny songs only when he himself was in front of the camera-no playback mate-so no singing for others. This was the scene for 23 long years 1946- 1969 with all music directors-A Very Versatile Singer Indeed!!!! Your knowledge about the Aradhana songs is like half-baked cakes -SD fell ill critically during the making of Aradhana and thus RD came into the picture-subsequently Kishore entered the scene,the Rafi songs were already recorded earlier.You mention the use of Kishore by LP -yes LP did use Kishore but he used him as a weapon against RD -Removing a thorn with a thorn.Kishore got the choicest of songs from LP and the most different ,imaginative and creative songs which actually showed Kishore as a far better singer than he actually was-But still all Kishore fans are only Dumbstuck about Kishore songs with RD,in fact RD lost out to LP bcos of his overdependency on KK.And yes if you have got ur facts right you will not find any worthy songs from LP with Kishore except the songs from Karz. You say this in you article as a matter of Pride “Only one minor hitch I can think of and that is no fault of KK. It’s been said before that whenever KK felt uncomfortable with a particular word(s) in a song or if he didn’t understand it, he would ask for it to be changed so he could convey the lyrics with the right emotion”. If this is true and we all know that it is 100 percent true (He lost out the Title song of Ek Mahal Ho sapnon ka to Rafi -cos the Producer of the film and Not the “Music director” of the film found him incapable of being able to render the song as needed with the emotional content and the singing intricacies) ,still according to you and so many countless others like you-“He is the Most Versatile”-but needs a little bit of toning down here and there to suit his singing capabilities.Isnt that what you want to convey? Better luck to you for your next articles.Hope you find something worthy to write next time.All the Best. Thanks for your reply. First let me start out by stating some qawwalis KK has sung to respond: Chand Sa Koi Chehra (Sholay), Kaisa Parda Hai (Phool Khile Hai Gulshan Gulshan), Main Jis Mehfil Mein (Badle Ki Aag), Hum To Jhuk Kar Salaam (Fakira), Apna To Zamaane Mein (Naya Andaz) are just some of them. Bhajans include Aao Kanahi Mere Dham, Kahe Apno Ke, Prem Ka Rog, Ek Roop Kai Naam, and many more. If you read the article carefully, you’ll notice that at the beginning, I clearly state that this PARTICULAR article will focus on KK’s ghazals. As far as your take on Aradhana, you’re right; S.D. Burman DID fall sick. What I state in the article is that it was still S.D. Burman’s choice to include KK in the film. That has been proven by the famous incident when S.D. Burman came up with a slow tune for Roop Tera Mastana and it was KK who suggested uping the tempo a bit to suit the situation. This incident has been shared by many people in various interviews including Amit Kumar and Manna Dey. In fact, Amit Kumar has even sung snippets of the original tune that S.D. Burman came up with in a couple of concerts of his that I attended. As far as him needing toning down, when did I ever say that? I said that KK felt the need to understand the words to a song to convey the emotions probably. Asking a meaning of a word doesn’t include toning down! As far as KK not singing for other actors in the fifties, (and I assume you mean barring Dev Anand) well I don’t know what say except that you’ve probably never heard the songs of Pyar (1950), Malkin (1953), Naujawan (1951), Kaafila (1952), Joru Ka Bhai, (1955), Shisham (1950), Bhoot Bangla (1965) Maa (1952), Hamari Shaan (1951), Ada (1951), Rhimjhim (1949), Mastana (1954), Shamsheer (1953), Parineeta (1953), Johar Mehmood in Bombay (1965), Shin Shinaki Boobla Boo (1952), Aawaz (1956), Bahar (1951), Shrimatiji (1952), Naulakha Haar (1953) etc.That’s just a fraction of the list of films which KK sang in in which he did not act. I can certainly name more if you wish. Now if you say that music directors underestimated him during that era, it would be absolutely correct, no question about it. However, those same music directors like Naushad and Salil Chowdhary and several more have openly said on the record that that was a mistake on their part. (Track down those interviews if you don’t believe me). Couple that with the fact that at some point KK got really busy with his acting career (roughly 38 movies in the 1950s alone and some 40 odd movies after that) which made it extremely difficult to focus on playback singing for others around that time. As far as Kishore fans being dumbstruck on only knowing about his R.D. Burman songs, well my article as well as my response to you clearly proves that that’s not the case. And as far as LP not giving any worthy songs to KK except Karz, again my article (as well as 100s of other songs that can be named if you wish) disproves that. Well Mr Neel this is regarding the last para of your comment – i had said about KK not getting any worthwhile songs from LPM after AAA(Amar Akbar Anthony),Dharamveer and Hum kisise Kum Nahi-1976-1977 to be precise after the Unparalleled comeback by our great Rafi saab ,yes LP had used KK as a tool against RD-“Taking out a thorn using a thorn” and only looked at kk for karz -if you see the history with the right vision.Anyways lets hope you have some better work to do other than criticisng Rafi. I don’t think Naushad ji said it was his mistake to not use kk but Naushad ji said kk liked to sing under his music,as Naushad interview he said to kk my tape of music not for you,if not like that so why Naushad used kk only once, dev ji is the first actor who used kk voice,It said about Indian films music like this it born in 1940’s end,wad baby in 1950’s,became young in 1960’s ,was old in 1970’s and died in 1980…..
First of all, when did I criticize Rafi? Please do let me know the exact statement in my article or in my subsequent comments and we can talk about it from there. And maybe you should do your research a little bit more because the music of Hum Kissi Se Kum Nahin was by R.D. Burman, not Laxmikant Pyarelal! As far as KK’s “worthy” songs for LP during 1977-80, the term “worthy” is quite subjective as everyone has their own opinion of what a “worthy” song is. However, if you’re talking about good, melodious songs; then how about Phool Khile Hain Gulshan Gulshan? How about Badaltey Rishtey (which had some wonderful songs by Rafi as well)? Or how about Palkon Ki Chhaon Mein? Or Amar Deep, Aadha Din Aadhi Raat, and/or Gehrayee? Dostana (which again had Rafi as well)? Thanks for your reply. I never said that Naushad said it was a mistake that he didn’t use KK, I said he admitted that he made a mistake in underestimating his talent. The quote you’re referring to is originally from the book Notes of Naushad in which Naushad talks about KK complaining to him about never giving him songs. That quote is NOT verbatim as I said earlier about having difficulty locating the interview right now, but it pretty much sums up what Naushad said in the interview. My God……..well….being a kishore kumar fan and a very good singer(as my friends would swear) I am looking for opportunity, where a banker, an unprofessional, unqualified singer like me is given a respectable chance to sing on stage. At my place of posting, they usually call professional groups to stage shows of old songs, and some people have started encouraging me to sing on stage. The same way I had become “voice of Kishoreda” in Rajkot, albiet for a few months, and then I was transferred. A few week hence, they are gonna stage a show in Rafi Sahab’s memory. They have asked me to sing at least two solo songs, which Rafi Sahab and Kishoreda both sang. One such song is Tum bin jaoon kahan. I was looking for some more on the web, that I encoutered sites like this. I couldn’t find any. (Can somebody suggest me excuse to intrude in a Rafi Show with Kishore song? E.g. Rafi Sahab rejected Mere Naina, Mere diwanepani, et el and Kishoreda was offered? But some more excuses that Kishore da only imitated Rafi Sahab’s feelings to render these songs in a way to show respect to him? or are there some more solo songs, which actually both sang and were picturised? )……well, encounerting you people, very great music lovers, and scholars at that, I was tempted to connect to you. My fond regards to you, and wish you all the best to keep alive those days of yore, all the records and times. Thanks a lot. And yes, in my view Mere Diwanepan ki is the better one(amongst his gazals), even better than Manzilen…personally because, even as a kid i had mastered singing manzilen, I wouldn’t even try mere diwanepan…later I when I became successful in singing that, I realised, it was perhaps the best song, which Kishoreda had immersed himself while singing…he appears to be just lost…as one day I found myself successfully singing the song…..while I was lost somewhere, not realising what i was singing…………a very spiritual rendition..
Have anybody not heard about kishore da’s PHIRTE HAIN KAB SE DARBADAR ,AB IS NAGAR AB US NAGAR,EK DOOSRE KE HAMSAFAR, MAIN AUR MERI AWARGIEE… I never read any extension about it at here. Its shame for every kishore da lovers. Kindly listen to this song sung by Kishore Kumar and you will yourself judge where he stands. Please listen to this song of KK and judge for yourself. Didn’t know what you meant by “at here” but if you meant in this article, Main Aur Meri Awargi doesn’t really fit because it’s a nazm, and a beautiful one at that, but not a ghazal. Thanks for reading. Hello Mr. Mark. You are absolutely right! Kk is a mystery. Yes I’m sure that part of Pag ghungroo did’nt sung by Kk. As far as I know that particular part sung by Bappi lahiri’s father. He was a kind of Ustad. And I heard that song of Guru. Amazing! Kishore da knew everything. For example, have you heard a song of yesudas. Mana ho tum behad hasee. Just realise whether Kk would have sing it.The tune made for him I think so, while sung other song in the same film called Nanna sa panchi re tu. Nice song! But not like mana ho tum!! I’m sure some lunacy had been done by Kk during recording that director bound to give the song to Yesudas. Like this Kk loosed many melodious tune I think. Otherwise do you think, Anup ghosal is fit to sing Tujse naraz nahi zindegi?? a dischordant singer!! Saw some remarks from Mr Makarand Saraf in posts and feel sick. Kishore doesn’t need anyone to prove he was better singer than Rafi or not. Dear frndz…..wowww what collections thanx……. First thing to clarify that Kishoreda earlier himself chose to sing only for himself or his best friend Devanand (and that too when SD Burman composed). It was only Sachinda who pursuaded him to start playback for other actors which started with Rajesh Khanna in Aaradhana and made Rajesh Khanna a superstar. Also Kishore decided to give his voice to Rajesh khanna only after interviewing him and liking his thoughts. Kishore actually gave Rajesh Khanna, Amitabh Bacchan and Devanand Superstar status which was not possible for them without his songs. Kishoreda was greatest of great and billions of Rafi, Mukesh and Manna dey etc also can not make one single Kishore Kumar. Kishore Kumar was most popular figure in Hindi Film cinema industry till date and will remain forever. Gruji is second to none. He had aii kinds of vocal quality to sing all types of songs. Gruji is second to none. He had all kinds of vocal quality to sing all types of songs. Dear Neel, itz been almost 2 years since i’v posted u last. if u plz care to notice, in my last post i had informed u about my Thesis [with a difference] about our loving & very own – the great KISHORE KUMAR. i also beg to take this opportunity to inform u once again that my most priced possession, my interesting creation (as claimed by all my few near ones who had been through it) has reached completion. The write-up along with illustration consumes around 100 pages in A4 size. i had even took pain to upload the same but was stated that the charge is going to sky-rocket @ Rs.25,000 for a period of a few months or say, a year. Now sir, it seems quite impossible since i belong to the lower middle class & lack in means to master my dream. Plz b kind to advise at the earliest. regards, shuman. My e-mail : shumankrc.01@rediffmail.com. Very well articulated article ,thanks for the rare information you brought about Great Kishore da,I m a great admire of both Rafi saheb and Kishore da,both of them were Extraordinary singers and can’t be compared.Guys it’s my humble request don’t compare them with one -another .What I feel that songs which are meant to made for Rafi saheb could be done full justice by only Rafi saheb and same with kishore da. Mr. Neel Trivedi, first of all let me thank you so much for writing an in-depth and excellent article about my god Kishor Kumar. It’s a real tribute to the legend. I wonder you took so much time to express all the feeling for our Guru. Thanks dear.. I am not a scholar of ghazals but isn’t ‘Pyar ko chahiya kya ek nazar ek nazar..’ by Kishor Kumar fall in category of ghazals. @Anshuman Verma, Pyar Ko Chahiye Kya is not a ghazal, it’s a nazm. hllo friends….dis is Kshitij…m a huge kishore kumar fan..i truly believe & agree wid the statement that kishore da is truly the most versatile singer India has ever produced…especially if we consider the fact that he was not a trained singer at all……i just want to ask can anyone send me the lyrics of one of his rare and unrelesed songs…. junoon-e-ishq… ? Anshuman Verma, thanks for replying. To answer your question, “Pyar Ko Chahiya Ya” falls under the category of a Nazm, not a Ghazal as it doesn’t follow the poetic rules of a Ghazal. « Birthday Celebrations – Kishore Turns 81!